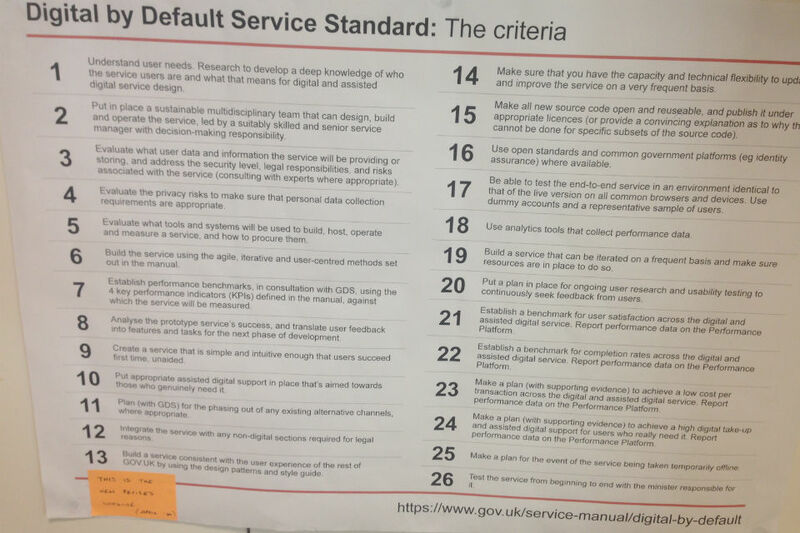 Across the Civil Service, teams have been using the Digital by Default Service Standard to help them build digital services of a consistently high quality. 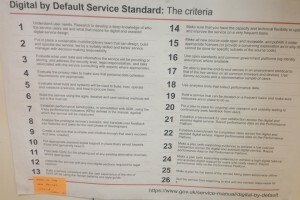 The service standard has 26 criteria which teams use to help shape how they develop a service. A service is assessed against the standard at 3 different stages to make sure it’s on track. The service standard makes sure that the people who are going to be using a service are at its heart. It also makes sure that the team building the service has the right people in it, with the right skills, and that the service can be updated and improved in response to feedback. Until now the service standard has only applied to services for the public, but from now on it’s also going to apply to internal services, which civil servants use. It will apply to new services and ones which are being redesigned. This could include services which all of us use, like Civil Service Learning, through to services being developed by one department for use by people there, such as a correspondence handling tool. Some departments have already made a great start on this. For example, the Ministry of Justice have a team who assess their new internal services against the standard and make recommendations to help them improve. Where a service does not meet the standard they must address the recommendations before being able to proceed. Because this is new, and teams will need to think about the way that internal services are developed in a different way, we are going to be testing this. For the next 6 months, internal services will be assessed against the service standard, but they will be able to continue development so long as they meet 3 important points. They must: be safe and secure; meet a user need; and be easily changed and improved. Although most points of the service standard will always be applicable to internal services, they are not always the same as public facing services. So, there are some points of the standard which can be at the discretion of the digital leader (or GDS, if responsible for the assessment). We'll test these during the next 6 months to make sure we've got them right. Departments will be running the assessments for services which are for their own departments. GDS will run the assessments for those services which are used across departments, or have a high number of transactions. Most departments already have internal assessment teams in place which are usually made up of people who work on digital projects. Where these are growing we are providing training at GDS for new assessors. Get in touch if you would like to take part! Excellent news. Here at DfT we're beginning on the road to replacing our Intranet and are proposing a digital by default approach, knowing we're on the right tracks is encouraging. We're also looking at renewing/redesigning some of our internal channels within the Highways Agency, and this is a very useful model to follow; a good example of sharing best practice, too. Nice one! Hi, (late in the day, but...) great news indeed. Is there guidance as far as UI is concerned? Or anything that says that the UI should/could be consistent with existing style guides for public facing services? That is a tried and tested design, of course, so it would be good to know what the steer from GDS and if we should use that as a starting block.